It’s vacation time and maybe you might not want a bunch of emails piling up in your inbox until you return home. 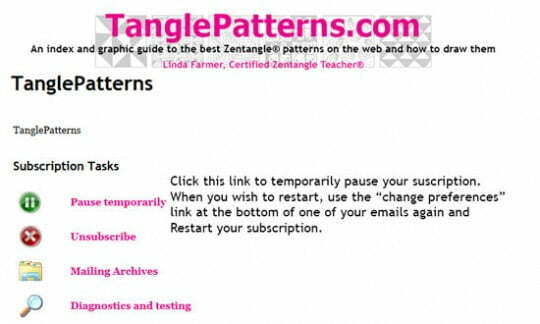 Did you know you can pause your subscription to TanglePatterns? Actually there are quite a few options that you can take advantage of with your TanglePatterns subscription. You can even change your email address so if you get a new email address your subscription will continue without interruption. To pause your subscription temporarily, click on the link that says “change your preferences” and you’ll be taken to a page that looks like this. To pause your subscription, click the link that says “Pause temporarily”. When you wish to restart your subscription, use the “change preferences” link in an old email to get to the Preferences page again and click on the “Restart Subscription” option. Easy! To change your email address – If you get a new email address, use the “Click here to safely unsubscribe” link in one of your emails – even though you aren’t actually going to unsubscribe. When you click the “safely unsubscribe” link you will be taken to a page that looks like the one below. Click on the fuchsia/pink sentence that says “Wait! Change your email address yourself.” That link takes you to your Feedblitz profile page where you can replace your old email address with your new one. There, see how easy that was? If you need to refer to these instructions again, I’ve also got them linked on one of the pages on ABOUT tab on the top menu bar. There’s also an FAQs page there that might be helpful. As addicting as the aroma of hot, buttered popcorn! Hooked for life!